A huge step toward reform would be to elect new politicians not beholden to the real estate industry and who take an aggressive position on over-development – in a way that isn’t mere grandstanding to get elected or stay in office. However, we also need to change the rules of the game that render citizens powerless in the face of the real estate lobby. Those rules might be embedded in laws, the zoning code, the City Charter, or just in the rules that agencies use to manage themselves. Here is a short list of ideas (from various sources) that are all about reforming the “rules of the game.” You may have more. Let us know about them. Together, we can flesh them out. Enact a city ethics law. When a developer admits to a “pay to play” transaction to gain a favor, and that favor happened, require the office-holder to resign even if the law says it is not “officially” an act of corruption. Reform the rent laws. A good start? Overturn the Urstadt law, end vacancy decontrol, and end the preferential rent bonus for landlords. Modify the City Charter to allow recall of city elected officials. Eliminate the loopholes in the Campaign Finance Law that allow big real estate to ignore the “doing business with the city” donation limits. Lower the maximum campaign contribution in the Campaign Finance Law to $500. Triple the public matching rate. That way, politicians don’t have to rely on rich people to finance their elections. At the same time, reduce the amount publicly financed candidates may spend on elections. Lower the number of signatures that Mayoral candidates need to access the ballot. That makes candidates less dependent on the political machine. Support the many voting reforms such as non-partisan elections, early voting, and rank-choice voting. Define minimum and maximum densities of humans per acre and housing units per acre, but start with substantive public debate on the matter. Cap air rights transfers (TDRs) so that developers can’t use them to build more than 20% higher than permitted prior to a zoning-lot merger or a spot-rezoning. Do a major overhaul of conflict-of–interest rules so that lobbyists for special interests, former high-level city officials, and executive teams of political clubs can’t serve on regulatory agencies or community boards. Eliminate the baked-in loopholes and “abuse of definitions” in the zoning code that favor developers (ex: abuse of voids, mechanicals spaces, and ceiling heights). Oblige the Department of City Planning to publish a one-page “Notice of Intent to Consider a Rezoning” a year before any studies or agreements are in place. The notice should have a map and a reason why City Planning thinks the existing zoning is not good enough. That notice should provoke an immediate speculation tax on all property transfers in the area until the rezoning plan is confirmed or moot. Publish a list, updated monthly, of all developers, their lobbyists and their attorneys who visit the Department of City Planning, who they met with, and why. Impose a “view tax” on new construction. Tax the square footage that breaches the average height of a block’s cornice line or attempts to capture views of parks. Oblige developers to indemnify residents whose windows are blocked by new construction, if those affected had light from those windows for at least ten years. Stop all sewer hook-ups until our treatment plants comply with the Clean Water Act. Create an independent, publicly funded think-tank with no affiliation to real estate to counter the false narratives and claims of REBNY concerning land-use. Make Community Boards Elected – after all, do we need Borough Presidents to decide who represents our views? It is like having our very own “Electoral College” at the neighborhood level providing cover for bad ideas & real estate deals. 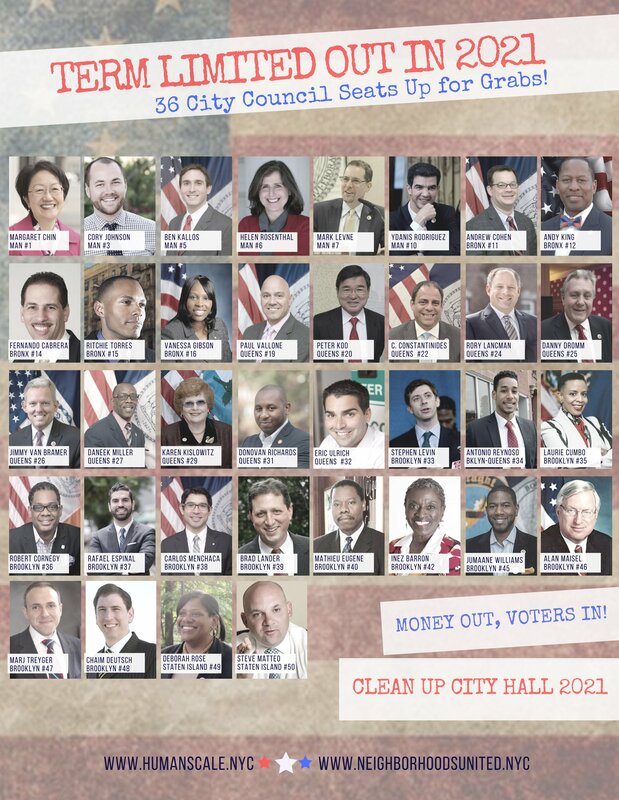 Impose term-limits on community board service. Ten years is more than enough. Old-timers can contribute their ‘institutional memory” as non-voting members. Elected community boards should have the right to approve community zoning plans. Non-elected ones should have no such right. Put a demolition moratorium on buildings that house rent-stabilized units. Transform the office of Public Advocate into an investigative unit focused on pay-to- play corruption across all agencies having to do with land-use, with the power to bring charges and issue fines that are more than “slaps on the wrist”.